Organic Tart Berry Herbal Iced Tea brews up a beautiful jewel-toned shade of red and is as good as it gets when it comes to caffeine-free iced tea! 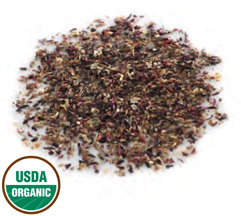 You just can�t get a fresher, fruitier, tastier herbal tea! Case of 24 1oz filter bags. Pour 1/2 gallon of boiling water over the filter bag, steep until desired color/flavor is reached, remove the filter bag, add ice & water. Simple! Each filter bag makes 1 gallon of tea.